Is Stack Overflow Useful for Web Developers? But where should Web developers go if they have such queries which need answering? Might Stack Overflow provide an alternative? Stack Overflow is a programming Q & A Web site which is collaboratively built and maintained b fellow programmers. The Stack Overflow About page goes on to add that “The only unusual thing we do is synthesize aspects of Wikis, Blogs, Forums, and Digg/Reddit in a way that we think is original“. The FAQ goes on to add that you should “avoid asking questions that are subjective, argumentative, or require extended discussion. This is not a discussion board, this is a place for questions that can be answered!“. Stack Overflow goes beyond the simple responses that can be provided on a mailing list, allowing the person who asked a question to identify the answer which has been the most helpful. 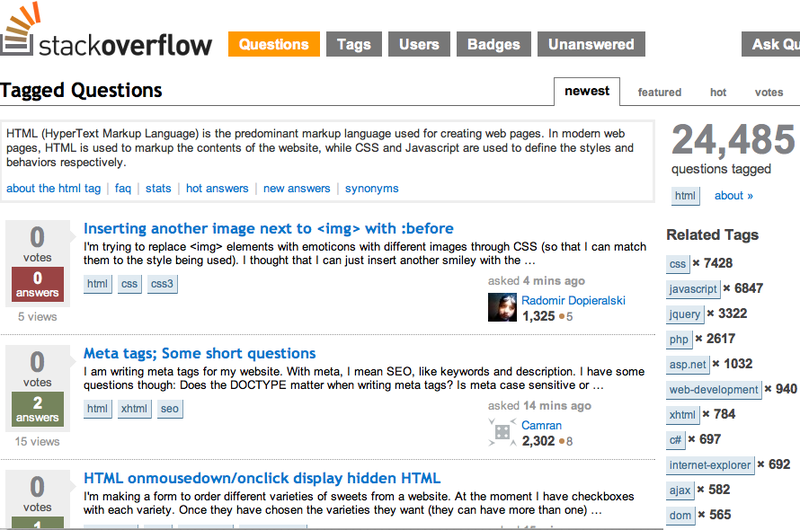 Participants in the Stack Overflow community can also rate the responses so that people who response with useful answers will gain reputation points – as Tony Hirst (pyschemedia on Stack Overflow, from the Open University, has shown recently with the first points he has been awarded after providing an answer to a question about Yahoo Pipes. Once a certain level of reputation has been gained additional responsibilities are available including the ability to moderate contributions. I can’t help but feel that although the web-support JISCMail list was useful in the early days of the Web Web developers should be making use of richer environments for helping them in their development work. Isn’t it time we acknowledged that the web-support list is now primarily an announcement list for jobs and events and a service like Stack Overflow can fulfill the service of finding answer to Web development queries? And since we have a lot of expertise across the sector, with people clearly willing to help and advise others, we could soon see UK Web developers with high reputation ratings on the service. This entry was posted on 7 Oct 2010 at 11:15 am	and is filed under HTML. You can follow any responses to this entry through the RSS 2.0 feed. You can leave a response, or trackback from your own site. I’m pleased that you seem to have found it useful. I’d be interested in seeing evidence that not only “most web developers will have come across Stack Overflow quite some time ago” but that is is being widely used within our sector. I note, for example, that a Google search forStack+Overflow on the JISCMail Web site finds only a single reference to the service out of the 89,300 resources indexed by Google. Are you aware of ways in which evidence of Stack Overflow use within our can be obtained? There doesn’t see to be a way of befriending people on Stack Overflow, for example. I’m not sure about your “sector” (whatever that is?) – but perhaps you could do a straw poll to find out? I’m primarily interested in the UK HE Web/developer communities, though I also have an interest in the wider cultural heritage sector. The post was aimed at providing background information for a straw poll; you, Mike Ellis and Matt Jukes are fans, but I’d like further comments from a wider group. I’ve raised the issue on a mailing list as well as on Twitter. I agree with your point that Stack Overflow can be useful as a both a knowledge base of answered queries and a place for asking queries (and also for answering them). I suspect a lot of people ‘Google first, ask questions later’; they don’t necessarily have to be an active member of JISCMail, or Stack Overflow, in order to find the information, as most of the answers are in the public domain. It’s only when niche or non-trivial scenarios pop up, that people have to resort to asking the community. As for which community to ask, isn’t it all about the context? I find Stack Overflow is very useful for coding connumdrums, whereas JISCMail is the better of the two for in-context questions relating to my role within the institution (note: some of the e-learning JISCMail lists are quite active in comparison). Anyway, as a final note, Stack Overflow also runs Server Fault, and Super User; two very similar sites with a different focus. I wonder if JISCMail moved some of its mailing lists over to this web-based/Stack-Overflow-style format, whether they’d be more successful? I find it very useful, it have helped me with a issue on my website. Also you can get a fast response on your question, real cool.